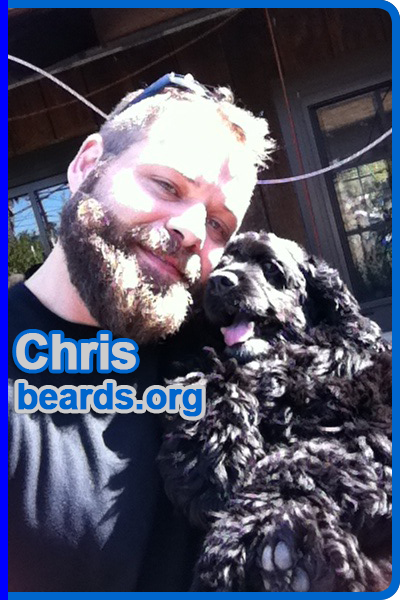 All about beards is happy to welcome Chris to the featured beards on beards.org! 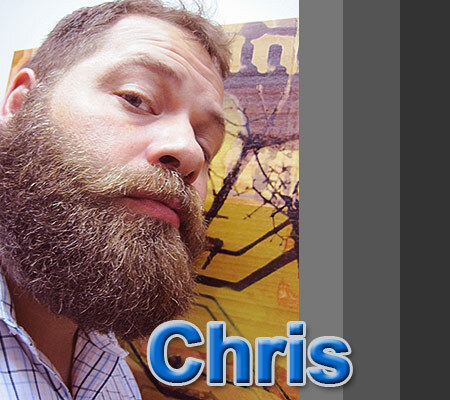 Chris is blessed with a true “power beard”. 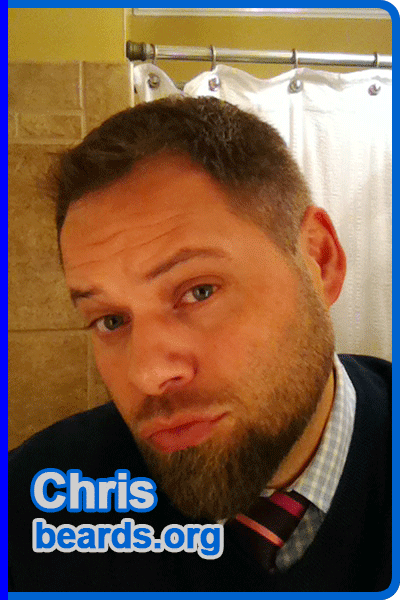 Although Chris is a veteran facial-hair grower, the full beard is relatively new to him. Over the last year, he has been honing his skills on how to really optimize his impressive full beard. 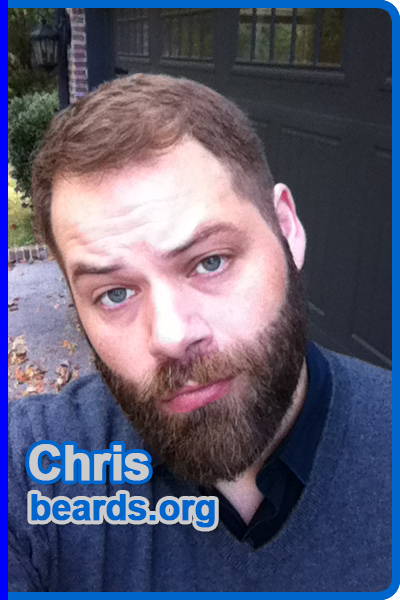 With a little help from information and advice from beards.org, Chris’ full beard has become a great success that commands attention and respect wherever he goes. Excellent job, Chris! Hi. 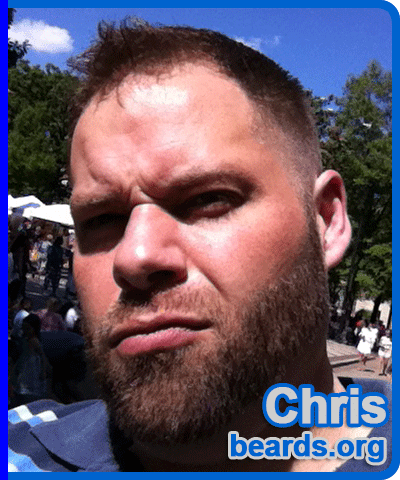 I’m Chris and I am a bearded man… Wait, this isn’t beard anonymous. And it’s pretty hard to be anonymous while sporting a full beard! Although I was born and raised on a farm in Canada, I’m a city boy at heart and have lived in California, Texas, and Alabama! I’ve had my full beard for less than a year, but I’ve had some sort of facial hair for almost twenty years now! Since I’ve had my beard, I’ve had endless comparisons to “Duck Dynasty”, ZZ Top, Grizzly Adams, Zac Brown, Santa, Yukon Cornelius, and even the original Brawny Paper Towels guy (although he only had a mustache). I’ve even had spontaneous invitations from strangers to compete in an upcoming beard contest. Honestly, about 90% of the feedback is positive, while there are a few out there who just don’t like it. I think a 90% approval-rating is pretty amazing, eh U.S. Congress? I’ve also noticed a bearded-man camaraderie, the friendly nod and approval from other bearded guys. It’s kind of like a fraternity without all the hazing to get in! P.S. My beard regularly gets swag now. I was on a business trip with an employee and we had a few hours to kill in Phoenix before our flight. So we stopped at a trendy bar for a drink. When we walked in, a guy at the bar made immediate eye contact and ran over. My employee asked who that was and I told her I had no idea. He’s a US Marine, there with his wife, and told me I was sporting his dream beard and proceeded to buy us BOTH drinks. There was a similar occurence at the House of Blues in Chicago. Also, while shopping the Magnificent Mile in Chicago, I met a DJ who hosts a hot party at Sound Bar. He’s a bearded guy as well and wanted to encourage men like us at his parties. He set me up with a VIP area for me and friends, with a few free drinks as well. All this sounds like a fairy tale, but I have witnesses of each occurrence! So, newly added to my “Why do I have a beard?” list: The free stuff! 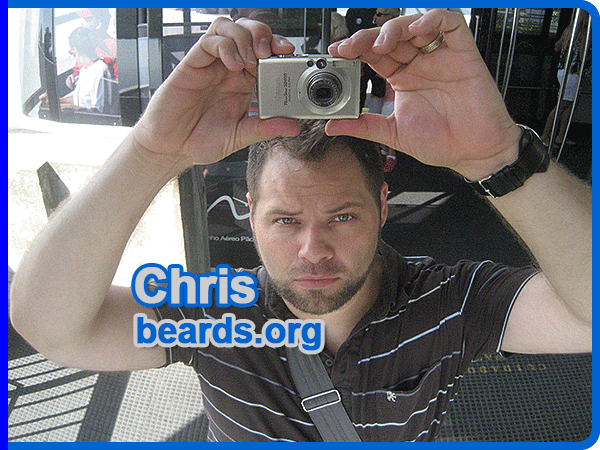 Now scroll on down to read Chris’ beard story. Then, be sure to visit Chris’s photo album. The photos on this page and in Chris’s photo album are courtesy of Chris and are used with permission. All photos are subject to the site’s conditions of use. I think a man’s beard is a gift. I have always taken my beard for granted and assumed that everyone has the same beard potential, but that isn’t true. I am regularly reminded of that now that I have a full beard. Men from all walks of life tell me that they are jealous of my beard, that they wish they had a beard like mine. But so many men have patchy beards or are lacking features that make their beards undesirable in their eyes. I’m glad that my beard is there for me when I want it to be. A man’s beard is a physical display of his commitment. Just like a muscled body or a well-honed craft, a solid beard takes effort, dedication, and sacrifice to reach its potential. But most of all, the most successful beard oozes confidence. When you have accepted your hairy face with pride, it goes with everything, from tuxedo to birthday suit and everything in between. I have had some level of scruff for the last twenty years: goatees, full face, etc., but just last summer I started down the journey of letting my beard grow out. Honestly, the attention I receive has been staggering. Friends, family, and even strangers have been so complimentary; it makes me wonder why I didn’t do it sooner. Many of my uncles have been bearded for years. As a kid, I always associated it with their generation, not mine. It wasn’t until I met some guys my age with spectacular beards that I even considered it. Do you remember from childhood ever wanting to have a beard when you grew up? Honestly, no, I don’t. I badly wanted hairy legs, though! LOL. The summer between my freshman and sophomore years in university, I was living with my sister so I could do some farm work for extra money. She’s a beard hater. So naturally, I grew a goatee and ‘stache. Then, when it was time to go back to school, I decided to keep it because my new roommate was also a beard hater. I guess you could say I grew it to be a jerk. LOL. At some point, I decided to shave it off. It was that point I realized how great my face looks with hair on it. I started growing it back immediately. I started letting my full beard grow out last summer. I was working on a project on the east coast with some tough cookies and thought a big ole beard would add to my intensity. And it demanded respect, just like I thought it would. My first facial hair attempt was a goatee. But it was the 1990s, so that was cool. I had to shave the little bare squares under my lip in order to get the look that I was expecting. That was pretty strange. I was really young, like nineteen, and always had such a baby face. It made me feel and look more grown up. I think I had some sort of trimming incident. LOL. I’m sure all bearded guys can relate. I think I destroyed it trying to fix my mistakes and ended up just shaving it off altogether. I started growing it back immediately. My face just looked like it was missing something. I think a full beard is the best way to really express your masculinity with your facial hair. It shows your natural beard tendencies instead of just a patch of scruff. However, I’ve sported and have an appreciation for all styles of facial hair. Have you tried any other style other than the full beard? Oh yeah: goatee, goatee with mustache, chin strap, long sideburns… Yep. In 2012 you went bigger and longer with your beard than usual. Was that the most you’d ever let it grow? Before summer 2012, I had never let it get very long. So yes, this was my first venture into full beardedness. What did you think of your bigger and longer beard? I really loved it. But more than that, so many other people loved it, too! Wow. I get a lot of attention because of this thing! Do you find yourself being something of a perfectionist with respect to your beard? How does that work out? Great question! Yes, and that is something I’ve had to address with myself. As a scruffy guy, I was able to maintain my facial hair easily with trimmers. I would edge it up, even it out, etc., to keep a very “neat” look. However, I’m way past using guards with my trimmer to maintain my beard. My partner tells me all the time that he likes my beard best first thing in the morning when it is CRAZY. LOL. I haven’t accepted that yet, but I have relaxed quite a bit with my “expectation” of a perfect beard. After growing your beard out longer, you suffered a trimming incident. What happened? Well, I didn’t know how to maintain a full beard, so I went to a barber for help. I told him that I wanted to keep the length in the front, and taper it back to be tighter by the ears. Fifteen seconds later, I had a giant dent on the side where he went after it with a guard! Like a four! I stopped him and went home and finished the massacre myself. This was in October. So I think I’ve recovered pretty well. Do you trim and shape the beard yourself? I have let a couple of barbers attempt to help, usually with disappointment. But I did learn the “freehand” style of trimming from them and yes, I do it myself now. How did you learn to trim and shape your beard? You have had higher and lower cheek lines on your full beard. What’s the story on that? Keeping my cheek lines even is a skill I have not yet mastered. I don’t think my face is very symmetrical. So I wind up with different looks on each side. In an attempt to correct, time and time again, I wind up going from a high cheek look to a lower one…LOL, not by design. What kinds of reactions to your beard do you get? How do you respond? I do. It’s more fun having a full beard then I ever realized. Sometimes I curl up my moustache, part it in the middle, brush it to a point, or bring it all forward like a Greek sculpture. LOL. It’s kind of like being pregnant. Everyone talks to a pregnant woman, about how she’s growing, and then they touch her belly. I get the same kind of attention, comments, and groping on my beard… Good thing I can handle it! Honestly, the attention it commands. Is that narcissistic? The only complaint I have about my beard is when mustache hair goes in my mouth while I’m eating. Other than that, I love it. What made you into a dedicated, permanent beard grower? Honestly, the encouragement and support from my partner and friends has inspired me to do this. If he didn’t love it, I probably wouldn’t have it. The real question here is: What plans does my beard have for me? But that’s a whole ‘nother interview. Yep. 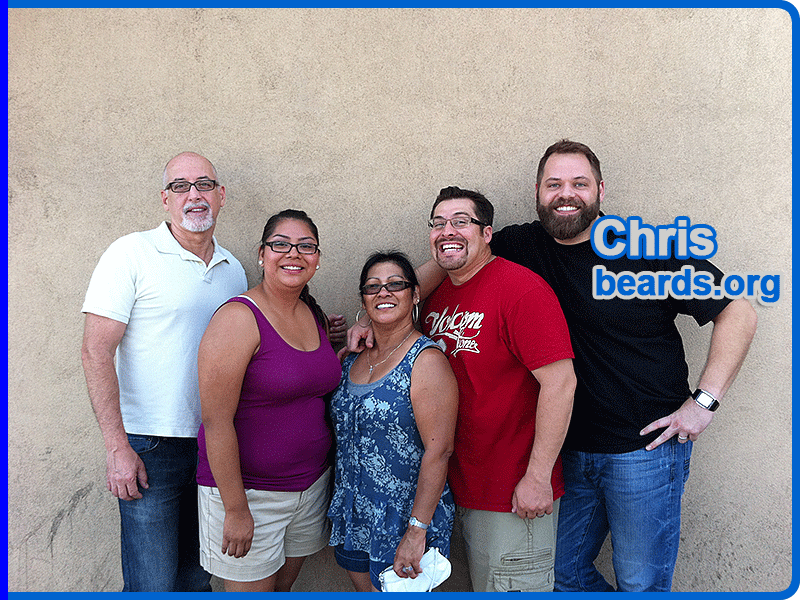 I’ve had friends and co-workers grow beards and tell me that they were inspired by me. They have not stuck it out to the FULL beard status, but they’re trying. Yes, the mustache here has been artificially enhanced for a costume effect. Would you recommend to other those guys who are capable that they grow full beards? I say go for it. You never know how it will look until you do it. I had no idea that my beard would take on the shape that it has and how much it flatters my face and look. It’s a part of me now. 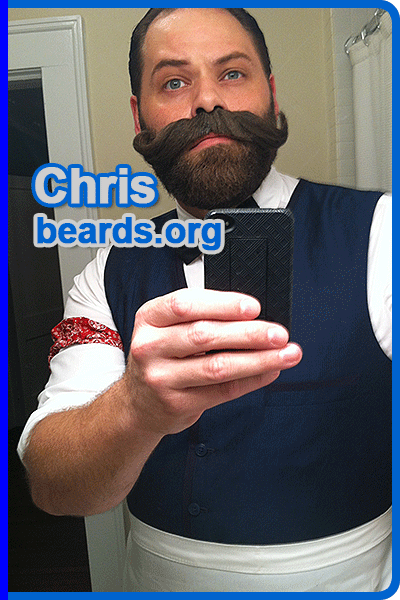 I’m very flattered that you think I belong amongst the amazing beards I see on your site. 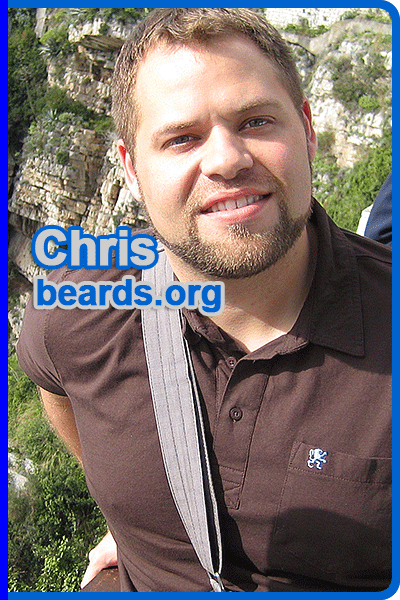 I know that among my friends, my beard stands out, but there are some awesome expressions of facial hair on your site! I’m humbled, and inspired, by many of them! It’s quite the elite club! Well, I first came to your site when I started my “full beard” journey last summer. As a long time scruffy guy, my chin line was very high. When I started growing more length, I thought something was “off”. Your site was a resource for me to figure out what I was doing wrong and how to correct it! And now, here I am! A featured beard! Couldn’t have done it without you. Click on the image below to go to Chris’s photo album.